Urdu, Punjabi, Hindustani, Persian, Arabic and many more. A less elaborate version of Nastaʿlīq serves as the preferred style for writing in Kashmiri, Punjabi and Urdu, and it is often used alongside Naskh for Pashto. In Persian it is used for poetry only. Nastaʿlīq was historically used for writing Ottoman Turkish, where it was known as tâlik (not to be confused with a totally different Persian style, also called taʿlīq; to distinguish the two, Ottomans referred to the latter as taʿlīq-i qadim, "old taʿlīq"). Nastaʿlīq is the core script of the post-Sassanid Persian writing tradition, and is equally important in the areas under its cultural influence. The languages of Iran (Western Persian, Azeri, Balochi, Kurdi, Luri, etc. ), Afghanistan (Dari Persian, Pashto, Uzbek, Turkmen, etc. ), Pakistan (Punjabi, Urdu, Kashmiri, Saraiki, etc. ), and the Turkic Uyghur language of the Chinese province of Xinjiang, rely on Nastaʿlīq. Under the name taʿliq (lit. “suspending [script]”), it was also beloved by Ottoman calligraphers who developed the Diwani (divanî) and Ruqah (rık’a) styles from it. Nastaʿlīq is amongst the most fluid calligraphy styles for the Arabic script. It has short verticals with no serifs, and long horizontal strokes. It is written using a piece of trimmed reed with a tip of 5–10 mm (0.2–0.4 in), called qalam (pen-قلم, in Arabic and Persian قلم), and carbon ink, named “siyahi”. The nib of a qalam can be split in the middle to facilitate ink absorption. Two important forms of Nastaʿlīq panels are Chalipa and Siyah mashq. A Chalipa ("cross", in Persian) panel usually consists of four diagonal hemistiches (half-lines) of poetry, clearly signifying a moral, ethical or poetic concept. Siyah Mashq ("black drill") panels, however, communicate via composition and form, rather than content. In Siyah Mashq, repeating a few letters or words (sometimes even one) virtually inks the whole panel. The content is thus of less significance and not clearly accessible. Persian Chalipa panel, Mir Emad. After the Islamic conquest of Persia, the Iranian Persian people adopted the Perso-Arabic script, and the art of Persian calligraphy flourished in Iran as territories of the former Persian empire. Apparently, Mir Ali Tabrizi (14th century) developed Nastaʿlīq by combining two existing scripts of Nasḫ and Taʿlīq. Hence, it was originally called Nasḫ-Taʿlīq. Another theory holds that the name Nastaʿlīq means "that which abrogated (naskh) Taʿlīq". Nastaʿlīq thrived, and many prominent calligraphers contributed to its splendor and beauty. It is believed[by whom?] that Nastaʿlīq reached its highest elegance in Mir Emad's works. The current practice of Nastaʿlīq is, however, heavily based on Mirza Reza Kalhor's technique. Kalhor modified and adapted Nastaʿlīq to be easily used with printing machines, which in turn helped wide dissemination of his transcripts. He also devised methods for teaching Nastaʿlīq and specified clear proportional rules for it, which many could follow. The Mughal Empire used Persian as the court language during their rule over South Asia. During this time, Nastaʿlīq came into widespread use in South Asia. The influence continues to this day. In Pakistan, almost everything in Urdu is written in the script, constituting the greatest part of Nastaʿlīq usage in the world. The situation of Nastaʿlīq in Bangladesh used to be the same as in Pakistan until 1971, when Urdu ceased to remain an official language. Today, only a few people use this form of writing in Bangladesh. Nastaʿlīq is a descendant of Nasḫ and Taʿlīq. Shekasteh Nastaʿlīq (literally "broken Nastaʿlīq") style is a development of Nastaʿlīq. Example showing “خط نستعلیق” (Nastaʿlīq script) written in Nastaʿlīq. And others, including Mirza Jafar Tabrizi, Abdul Rashid Deilami, Sultan Ali Mashadi, Mir Ali Heravi, Emad Ul-Kottab, Mirza Gholam Reza Esfehani, Emadol Kotab, Yaghoot Mostasami, and Darvish Abdol Majid Taleghani. And among contemporary artists: Hassan Mirkhani, Hossein Mirkhani, Keikhosro Khoroush, Abbas Akhavein and Qolam-Hossein Amirkhani, Ali Akbar Kaveh, Kaboli. Islamic calligraphy was originally used to adorn Islamic religious texts, specifically the Qur'an, as pictorial ornaments were prohibited in sacred publications and spaces of Islam. Therefore, a sense of sacredness was always implicit in calligraphy. A Nastaʿlīq disciple was supposed to qualify himself spiritually for being a calligrapher, besides learning how to prepare qalam, ink, paper and, more importantly, master Nastaʿlīq. For instance see Adab al-Mashq, a manual of penmanship attributed to Mir Emad. Folio of Poetry From the Divan of Sultan Husayn Mirza, ca. 1490. Brooklyn Museum. Quatrain on the Virtue of Patience by Muhammad Muhsin Lahuri of the Mughal Empire. Spousal Advice by Abdallah Lahuri of the Mughal Empire. Nastaʿlīq Typography first started with attempts to develop a metallic type for the script, but all such efforts failed. Fort William College developed a Nastaʿlīq Type, which was not close enough to Nastaʿlīq and hence was never used other than by the college library to publish its own books. The State of Hyderabad Dakan (now in India) also attempted to develop a Nastaʿlīq Typewriter but this attempt failed miserably and the file was closed with the phrase “Preparation of Nastaʿlīq on commercial basis is impossible”. Basically, in order to develop such a metal type, thousands of pieces would be required. Modern Nastaʿlīq typography began with the invention of Noori Nastaleeq which was first created as a digital font in 1981 through the collaboration of Mirza Ahmad Jamil TI (as Calligrapher) and Monotype Imaging (formerly Monotype Corp & Monotype Typography). Although this was a ground-breaking solution employing over 20,000 ligatures (individually designed character combinations) which provided the most beautiful results and allowed newspapers such as Pakistan's Daily Jang to use digital typesetting instead of an army of calligraphers, it suffered from two problems in the 1990s: (a) its non-availability on standard platforms such as Windows or Mac OS, and (b) the non-WYSIWYG nature of text entry, whereby the document had to be created by commands in Monotype's proprietary page description language. Windows 8 was the first version of Microsoft Windows to have native Nastaʿlīq support, through Microsoft's "Urdu Typesetting" font. Google has an open-source Nastaliq font called Noto Nastaliq . Apple provides this font on all Mac installations since Mac OS X High Sierra. Similarly, Apple has carried this font on iOS devices since iOS 11 . In 1994, InPage Urdu, which is a fully functional page layout software for Windows akin to Quark XPress, was developed for Pakistan's newspaper industry by an Indian software company Concept Software Pvt Ltd. It offered the Noori Nastaliq font licensed from Monotype Corporation. This font, with its vast ligature base of over 20,000, is still used in current versions of the software for Windows. As of 2009 InPage has become Unicode based, supporting more languages, and the Faiz Lahori Nastaliq font with Kasheeda has been added to it along with compatibility with OpenType Unicode fonts. Nastaliq Kashish[clarification needed] has been made for the first time[clarification needed] in the history of Nastaʿlīq Typography. 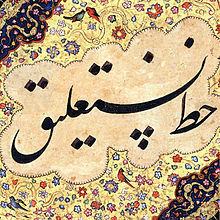 Shekasteh or Shekasteh Nastaʿlīq (Persian: شکسته نستعلیق‎; "cursive Nastaʿlīq", or literally "broken Nastaʿlīq") style is a successor of Nastaʿlīq. An excerpt from Shaykh Sa'di's (d. 691/1292) "Gulistan" (The Rose Garden), in Shekasteh Nastaʿlīq script. ^ The Cambridge History of Islam. By P. M. Holt, et al., Cambridge University Press, 1977, ISBN 0-521-29138-0, p. 723. ^ Hamed, Payman. "Famous Calligraphers - Persian Calligraphy- All about Persian Calligraphy". www.persiancalligraphy.org. ^ Gulzar,Rahman, Atif,Shafiq (2007). "Nastaleeq: A challenge accepted by Omega" (PDF). TUGboat. 29: 1–6. ^ "Famous Calligraphers". Persian Calligraphy. Retrieved 12 January 2012. ^ Khurshiq, Iqbal. "زندگی آگے بڑھنے کا نام اور جمود موت ہے: نوری نستعلیق کی ایجاد سے خط نستعلیق کی دائمی حفاظت ہوگئی". Express. Retrieved 24 November 2013. ^ "The evolving Story of Locale Support, part 9: Nastaleeq vs. Nastaliq? Either way, Windows 8 has got it!". MSDN Blogs. Retrieved 2013-03-24. Sheila Blair, Islamic Calligraphy, Edinburgh: Edinburgh University Press, 2005. Wikimedia Commons has media related to Nastaliq. This page was last edited on 14 April 2019, at 05:13 (UTC).